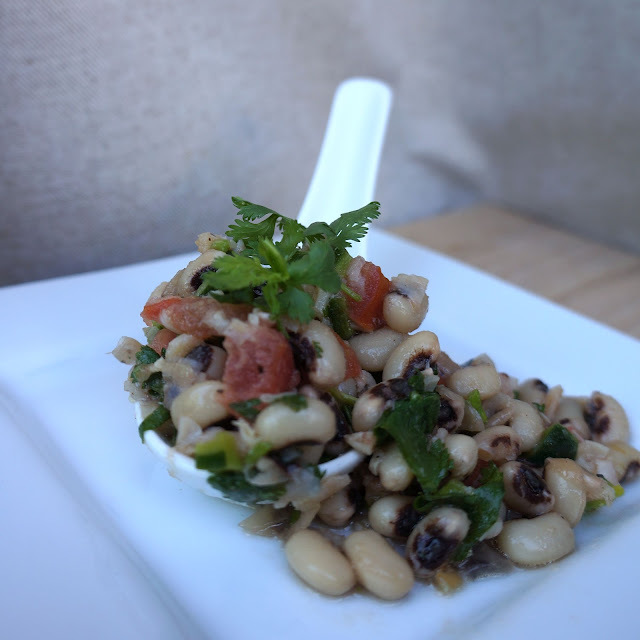 Now that we're well into summer, I can't help myself from stocking my fridge with fresh ready-to-eat salads like this black eyed peas salad. It's a bit like a salsa with fresh cilantro, tomato, pepper, and minced raw garlic. Its so yummy. Last night we had burrito bowls for dinner (because I forgot to pick up flour tortillas) and rather having beans and salsa separately, we ate it with this. It was perfect! The tomatoes and poblano pepper were grown right here in Montgomery at Hampstead Farms. Bring 4 cups water to a boil in a 2-quart heavy saucepan with black eyed peas and 1/2 teaspoon salt, then reduce heat and simmer, uncovered, until beans are just tender, about 30 minutes. Drain in a large sieve, then transfer to a large bowl. In a large bowl, combine the lemon juice, garlic, sugar, Dijon mustard, salt and pepper. While whisking, drizzle in the olive oil. Whisk until completely emulsified. Add the black-eyed peas, tomatoes, poblano pepper and cilantro. Toss thoroughly to coat. Season with additional salt and pepper to taste. Serve garnished with cilantro. There was beef in the burrito bowl.